Pacolito Phirstprize( Wilson) 36 cm spannable. He is roughcoated. 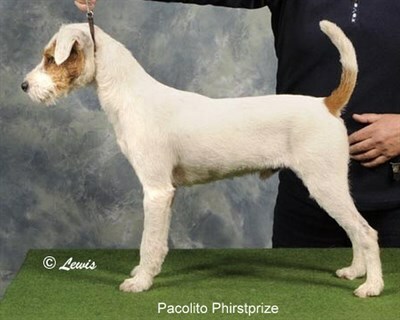 Pacolito Pirstprize ( Wilson ), is born on 29 august 2011 in the famous Pacolito kennel of Jane and Martin Baker in Doncaster, England. Both parents are UK champion, his mother Pacolito Phirstclass won Crufts 2010. Wilson is UK, Norwegian and Dutch champion. His son Harry of Sue Wilson is the most winning studdog on shows in Uk 2016. Wilson is a very friendly, quiet and affectionate dog. He has yachtinstict. His pups are always roughcoated with less colour, can give total white.